Rata is a native of the Philippines and Indonesia. Some botanists are, however of the view that it originated in Thailand. It grows all over South East Asia. 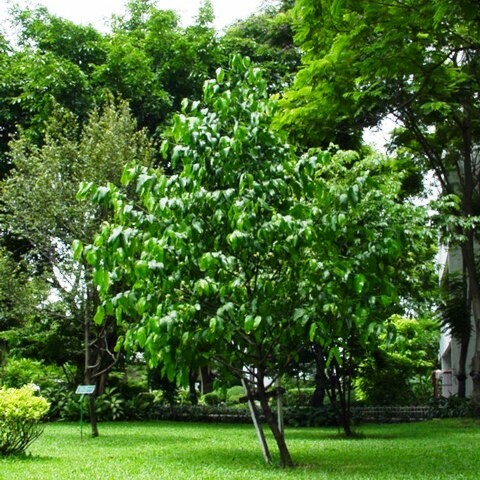 It is a medium-size tree with an upright growth habit and a cone-shaped canopy. The leaves are shiny green, reddish when young. These traits make also make rata a lovely ornamental. 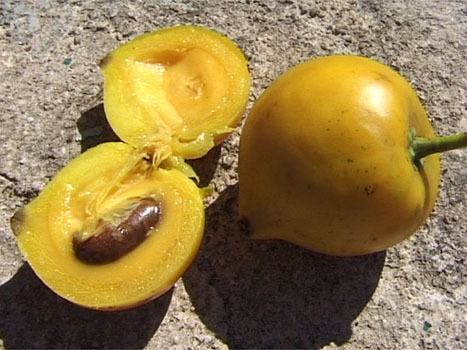 The fruit is yellow, thin-skinned and pleasnt to eat. Evergreen tree, up to 13 m tall with short trunk and brown bark, latex white, turning pale brown on exposure, latex in fruits yellow; twigs thick, four-angled, usually finely hairy. Leaves ovate to oblong-elliptic, 10-30 cm x 3.5-14 cm, pale green when young, dark green and shiny above, often hairy on underside; midrib prominent, vein lets numerous, parallel, short; petiole thick, up to 2 cm long. Flowers axillary, yellow-white, with sour smell, 5-merous; male flowers in small clusters, very small, about 6 mm wide, female flowers 12 mm wide, pedicel 1.5-3 cm long, stigma 5-lobed. Fruits globose, 5-8 cm wide, slightly pointed, often rather compressed, crowned by the persistent stigma; skin thin and soft, light yellow. Seeds 1-5, brown, about 2.5 cm long, surrounded by pale yellow pulp. The fruits can be eaten fresh. Though they taste sour but are still pleasant to eat. The flesh has a butter like consistency. The fruits also make excellent jam. In Java and Singapore pounded seeds are applied to cure swellings. In Java the bark is used to dye mats. 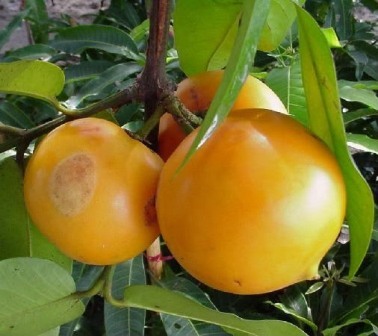 Rata is not cultivated as an orchard fruit but is planted in gardens as a specimen plant. It is easily propagated by seed. New plants can also be raised by air layering.